Animalization represents the Other as wild beasts in their lifestyle, dress, and sexuality. This theme opens a space to demonstrate how stereotypes often manifest through representing the Other as animals. 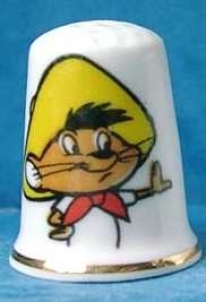 Examples include the cartoon Ali Baba: Mad Dog of the Desert and representations of African Americans and Native Americans as monkeys or savage beasts. Professor Kurashige Discusses Animalization In Portrayals Of Asians In U.S. Popular Culture. 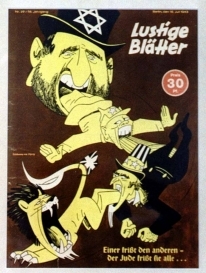 Lustige Blätter, humor and satire magazine published in Germany, 1941-1942, depicting Jewish cartoon character consuming a Russian, American, and English characters. Suffolk Center of the Holocaust, Diversity, and Human Understanding. Our Enemy illustration from the 1942 paperback book by James R. Young. Courtesy of the Wing Luke Museum, Seattle, WA. The Chinese: Many Handed But Soulless cover from The Wasp: v. 15, July - Dec. 1885. Publisher: Wasp Publishing Company. Library of Congress. The Hotspur magazine cover from March 16, 1940, published in the United Kingdom. Courtesy of the Wing Luke Museum, Seattle, WA.